Reminiscent of mineralized geodes, the Merola Tile Resort Coral Blue 12-inch x 12-inch x 5 mm Porcelain Mosaic Tile features varying markings throughout each chip. Coral blue is the base for the muted ocean blue striations casually flowing throughout each chip, creating the look of geodes. An illusion of additional depth and dimension is created by a smooth and sleek glossy glaze that tests your senses. Constructed of porcelain, this mosaic is best for walls or light traffic floors in indoor and outdoor settings, including showers, powder room floors, and backsplashes. Transform your space with stunning features of Country Glass collection by enhancing the appearance of your kitchen backsplashes, bathroom walls and floors, or accent feature walls. The Country Glass Tile Collection enhances the aesthetic appeal of a variety of environments and imaginations. MSI Sierra Blue Ledger Panel 6-inch x 24-inch Wall Tile is a Natural Stone Quartzite with a multicolour blend of grey, rust and white tones. Seemingly random strips of tile are glued together to form a panel that is easy to install. This frost resistant tile is suitable for indoor or outdoor walls in residential and commercial installations. Note: Inspect all tiles before installation. Natural stone products inherently lack uniformity and are subject to variation in colour, shade, finish, etc. It is recommended to blend tiles from different boxes when installing. Natural stones may be characterized by dry seams and pits that are often filled. The filling can work its way out and it may be necessary to refill these voids as part of a normal maintenance procedure. All natural stone products should be sealed with a penetrating sealer. Caserta Catskill O Blue Tiles, Set of 10 (22.5 sq.ft. / case) These carpet tiles are the best choice if you want a fashion forward, textured look at a great price for your higher traffic areas in your home. Used as an area rug, hallway runner or wall to wall, this tile provides a solution that does not require an installer or a separate adhesive. You can create a new look in an afternoon with this peel and stick system. The 18 in. x 18 in. tiles are cut with the "perfect cut" system, which ensures easy installation for a beautiful floor. The only tools you will need to install are a measuring tape, chalk line, utility knife with a sharp blade and a contractor square. Easily maintained by vacuuming or sweeping. In the event of a stubborn stain or damaged tile, simply replace the tile with a new one. This medium weight, unpadded tile can be used in basements, porches, exercise rooms, workrooms, and even outdoors. Caserta Catskill O Blue Tiles, Set of 10 (22.5 sq.ft. / case) is rated 3.9 out of 5 by 18. Rated 2 out of 5 by Eneri from Easy to install and looks good, but am disappointed by the quality. It's basically like a felt ma... Easy to install and looks good, but am disappointed by the quality. It's basically like a felt material with double stick tape. The instructions say to use a cutting mat and carpet knife to trim the carpet squares. Forget investing in these tools, the carpet tiles are so low quality that you can cut it with large sharp scissors. I have it all in but now I'm afraid it'll get sucked up when I vacuum it. Rated 5 out of 5 by Richard from Very Nice Product, I recently ordered this, and put this... Very Nice Product, I recently ordered this, and put this done in our apartment, it was very easy to install, and it looked very nice after done. I am very happy with this, and I love the color. Rated 5 out of 5 by Happy from Great product, simple do it yourself project, they made it easy. Great product, simple do it yourself project, they made it easy. Rated 4 out of 5 by El from Nice quality carpet for the price. It was easy to put down and a very pretty blue. 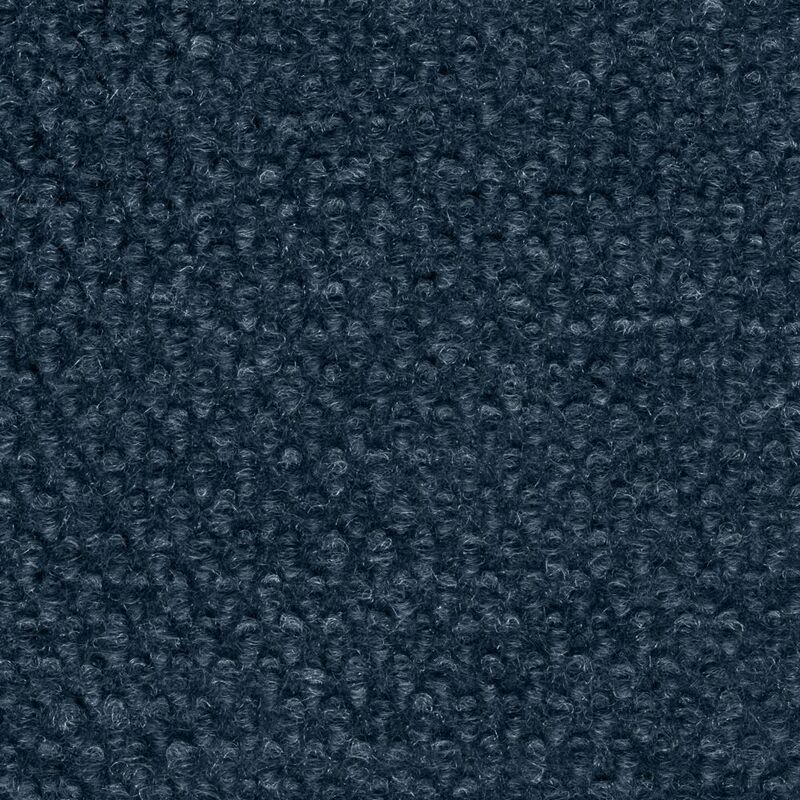 Nice quality carpet for the price. It was easy to put down and a very pretty blue. Rated 5 out of 5 by CGM from Worked perfectly for my space I live in an apartment building with a small terrace that was due for some updating. Two boxes of these tiles covered the whole space. They were easy to install, and look great! So far the carpet has held up well with some light rain. Will be curious to see how we do this winter, but so far, so good! Feels nice under our feet, but I’m not sure I’d recommend for indoor use other than a basement or mud room type space. Rated 4 out of 5 by Jeff from Arrived on time. Simple instructions and every piece was... Arrived on time. Simple instructions and every piece was marked. Just peel and stick. Sat on the floor and did a bedroom (on concrete slab) in an hour or so (with breaks). Been on the floor for a couple weeks and hasn't popped up or bunched when vacuumed. Rated 1 out of 5 by Glenn from Very poor quality and extremely overpriced. Now know why no... Very poor quality and extremely overpriced. Now know why no samples in store. Would never have bought it. Thickness of cardboard. Rated 5 out of 5 by PnQ from Very easy to install and looks really nice! Very easy to install and looks really nice!